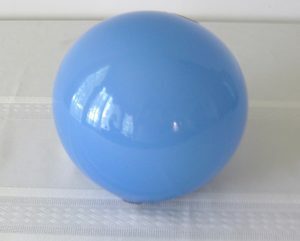 Excellent soft powder blue witch ball cased over white glass. 5 1/4″ diameter. Old collection labels still attached. Nice color and size. Excellent condition. “Pitkin” type Flask, c. 1800-1825. Pattern molded with 30 vertical ribs over 30 ribs swirled to the right. Probably Mid West origin. 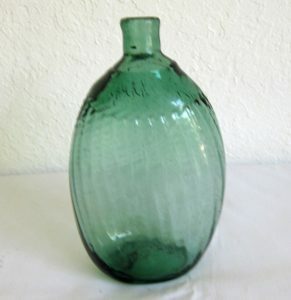 Elliptical formed body in a very attractive medium sea green color. 6 7/8″ tall with a rough pontil. The glass is clear and brilliant with no staining, chips, cracks, stars, etc. The base is a bit slanted and would benefit from a small amount of clay to add maximum stability. There is some high point exterior wear, but it does not detract from its appearance and bright color. A nice example in form and expecially color. A lovely lacemaker’s lamp complete with tin burner. 6 1/2″ tall with burner. Very nice 1/2 pint GVIII-25 Sunburst Flask in a light bluish green. 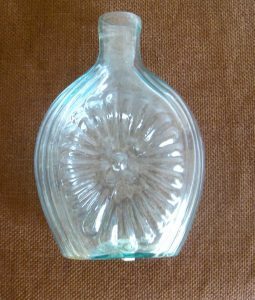 Probably Baltimore, early 19th C. A comparatively scarce flask in excellent condition – no chips, nicks, stars, stains, etc. 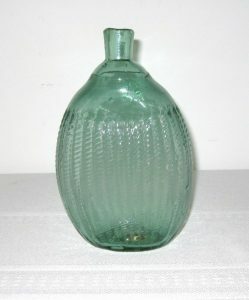 Glass is clear and brilliant with a nice original luster. Very good mold impression with virtually no surface wear, except base wear as expected. From a Florida collection. 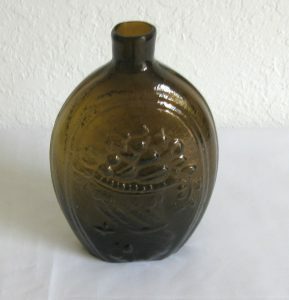 Very nice light yellowish green 32 rib “Pitkin” flask. Excellent mold impression from top to bottom. Strong tubular pontil. Excellent condition. Clear, brilliant glass. Good base wear. Very little body wear. 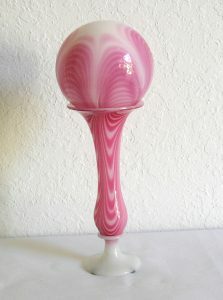 Beautiful and colorful witch ball and vase stand in white and pink. 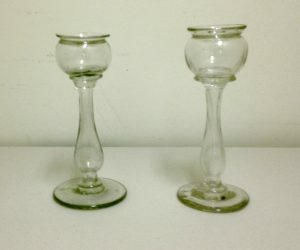 The base glass is white with nicely pulled pink loopings. The vase stand has 4 segments of loopings and the witch ball has 6. Nice form. Excellent condition with no damage. Size is 10 7/8″ overall height. 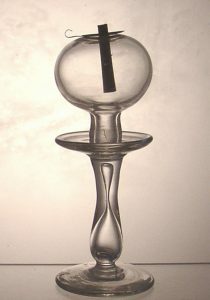 Vase stand is 7 3/8″ tall and the ball is 3 7/8″ diameter. American or English origin, 19th C. From a California collection. Very nice example of a pint GII-73 Eagle and Cornucopia Flask in a bright medium amber, Keene, NH Glass Works. Good mold impression and virtually mint condition. Glass is clear and brilliant with no damage, no stains or haze. No noticeable surface wear. Rough pontil. Base shows impression of mold line and 3 raised dots, a bit unusual. 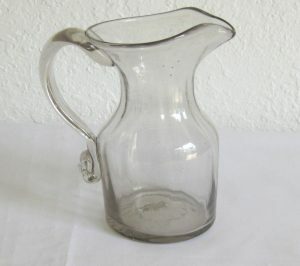 A most attractive early 19th C. American Pitcher in mint condition. Great helmut formed body with strikingly curved spout and an exceptionally formed hollow handle. Nice gutsy handle attachmenets with no problems. Well formed applied pedestal and circular foot give it an overall special design. Body is decorated with deep cut panels around the mid and lower body. 8 3/4″ tall. A strikingly pretty American pitcher. Fits nicely with the oversized sugar bowl below in size and form. True matched pair of early blown oil lamps. Blown font with raised rim and hole for burner. Long hollow blown baluster stem applied to font, and circular foot , no issues. 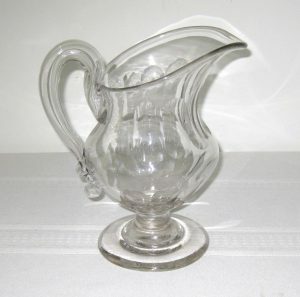 An exceptional Midwestern creamer/pitcher, probably from Kent or Mantua, Ohio. Great form with 16 ribs, excellent ear shaped strap handle with nice terminal wrap around crimping. Glass has a slightly gray lead tone. It is clear and brilliant with good original surface luster. A beautifully shaped early Midwest American example, early 19th C. Excellent original condition with no chips, nicks, cracks, stars, stains, etc.